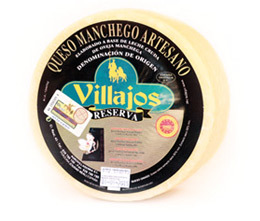 Artisan Manchego cheeses with Denomination of Origin that can be found on a full range of ripening statuses. You can also find slow pasteurised cheeses. 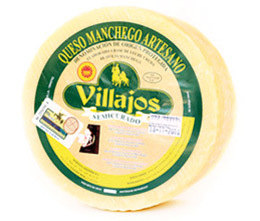 Villajos artisan Manchego cheese and Villegas cheeses are full of taste. There are plenty of sizes and presentations so you can always enjoy them. 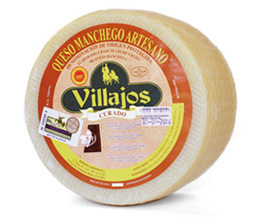 Our cheese is made from Manchego sheep’s milk, which is the main ingredient of our Manchego cheeses. The milk comes from the autochthonous cattle, that lives in a privileged environment to raise and give us this precious ingredient. Our cheeses are made from raw milk. When you taste our cheese, it makes you remind the old cheeses. The different types of cheeses you can find according to their ripening type are: semi-cured, cured/hard and aged cheeses. 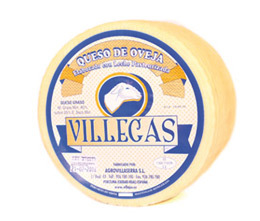 Villegas cheese is produced through pasteurisation, in contrast to Villajos cheeses. Nevertheless, its creaminess and taste make it the right cheese for every moment. 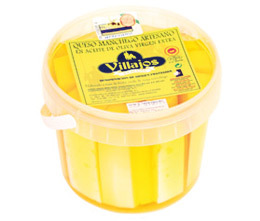 The types of Villegas cheeses you can find according to their ripening statuses are tender cheese and soft cheese. It is a cheese with a creamy and subtle texture and a soft taste but with a great personality and a pleasant and slightly acid aftertaste. The soft cheese is cured/hard for little over a month and it is midway between a tender cheese and a semi-cured cheese. It is soft but it also has a ripening taste. It is a creamy cheese with a soft and sligthly distinguished taste. It is cured for 3 to 6 months and has a soft and natural taste full of nuances. It is an ivory-coloured cheese with small and irregular holes. It has an intense taste with a characteristic aftertaste. Its ripening period ranges from 6 to 10 months. It is an intense ivory-coloured cheese with small and irregular holes. Strong taste with a characteristic aftertaste. Its ripening period takes more than 12 months’ time. This cheese is ripened for several months in extra virgin olive oil. According to the time passed in the oil, the cheese takes a pink tonality and a very a nice taste.